Millions of people are affected by arthritis. The inflammation and pain associated with this condition can significantly affect a person’s quality of life. You can reduce the symptoms of arthritis as well as improve your overall health by having a healthy diet which includes some healthy juices and smoothies. When making smoothies for arthritis and joint pain, focus on fruits and vegetables that are rich in quercetin and carotenoids, like apples, cucumbers, green tea, lemon, carrots, kiwi, pumpkin, and dark leafy greens like spinach. These foods can help lessen the inflammation and pain. Another good choice is pineapple, which has an enzyme called bromelain that helps reduce arthritis pain. Turmeric can also be used due to its potent anti-inflammatory, antioxidant and pain-relieving properties. Moreover, silica-rich vegetables like beetroot can also help the body in utilizing calcium properly, which is important for strong and healthy bones. Ginger can also help in easing the agony that comes with arthritis as it helps reduce swelling, pain, and inflammation. Pumpkin seeds can be sprinkled in your smoothie or juice for an added taste and benefits. These seeds have pain suppressing and anti-inflammatory properties that can lessen inflammation and joint pain. Put 1 cup of freshly brewed green tea in a blender. Add ¼ cup of chopped spinach leaves, pieces of ½ green apple, a sprig of parsley, ½ cup of pineapple chunks, the pieces of 1 kiwi, 1 tablespoon of pumpkin seeds (without the shells), and ½ teaspoon of raw, unfiltered apple cider vinegar. Drink a glass of this green smoothie for breakfast a few times a week on a regular basis. Using a juicer, extract the juice of a thumb-size piece of ginger root. Add 1½ inches of fresh turmeric root, 1 large cucumber (peeled and sliced), 2 cups of pineapple chunks, 3 medium-size carrots (washed and peeled). Juice all the ingredients together and transfer the juice into a glass. Drink this delicious juice several times a week on a regular basis. It can help reduce the arthritis inflammation and pain. Cut a medium-size beetroot into pieces and juice them. Add the pieces of small cucumber (peeled and sliced), a lemon wedge (peeled), and the chunks of small pineapple. Juice all the ingredients together and pour the juice into a glass. Enjoy a glass of this healthy pineapple and beetroot juice 2 or 3 times a week on a regular basis. Wash your fruits and vegetables thoroughly under running water before using them. If you are using organic products, you may not need to peel most fruits and vegetables. Cucumber peels, in particular, contain silica that plays a role in collagen and bone formation and helps with arthritis. Plus, it also reduces the risk of osteoporosis. You can also add tart cherries and pomegranates to your juicing recipes. Drink your juice within 15 minutes of making it and store the remaining in an airtight container in the refrigerator and then, drink it the next day. Avoid storing it for more than 36 hours. 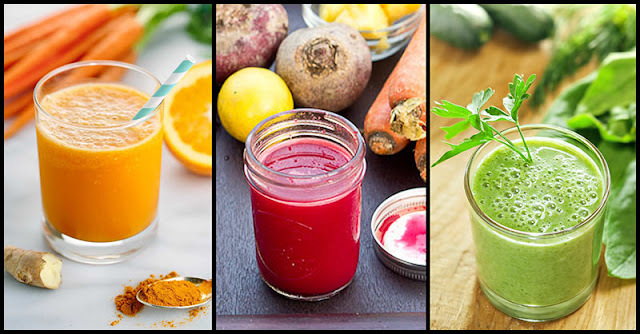 You must drink these juices on an empty stomach to help your body absorb the nutrients better. You can prepare the juicing recipes in a blender instead of using a juicer. Blend the ingredients, then strain the juice.